We have been happily enjoying the fruits of your labors for the past couple of months and want to compliment you for a job well done.Your workmanship was impeccable. Everything was built to our standards, which I might add, are very exacting. There were no cracks or gaps in anything that you built. People who come to visit cannot tell where the new work starts and the existing house ended. Amazing. It's exactly as we had hoped, a renovation and addition that looks seamless.We found you to be responsive to our needs. We were looking for someone to build our dream, yet providing design assistance when necessary. We did not need an architect or designer. Your eye for design is excellent. Details make the difference between a good and a great end result. Everything from the frieze boards on the exterior to the window trim on the interior is exactly right for the space. The house now has the understated elegance of good craftsmanship and design that we wanted.The interpersonal side of the project went very well. We were able to discuss issues that arose in a casual business like manner.A major renovation is stressful. The small things that you did outside of the traditional role of a builder minimized our stress. We want to thank you. Incidentally, I love my new garage! It provides what I was hoping for, and the lower level is warmer than I thought it would be in this cold winter. Still much I need to do to fix it up the way I want it, but something to do over the winter months. And, I was able to winch my PWC and sailboat into the lower level with no problem! I'm happy! 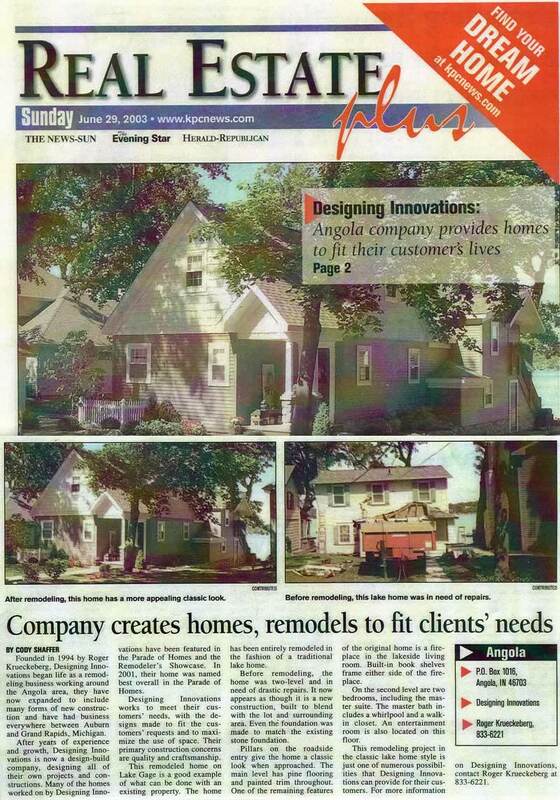 In 2007 my husband and I went to the Parade of Homes to get some decorating ideas for the home we were about to build. As we approached Roger’s entry, Castello di Lago on Jimmerson Lake, we were totally captivated by the exterior of the home. As we walked in, huge wood beams, oak floors, and a framed view of the lake through soaring two-story windows sealed our fate. We had just come home.Shortly after, we were working with Roger to finish the entire basement of the home. Our dream was to turn part of the basement into a library. I already had several bookcases and existing library furniture and wanted to add built in bookcases that would match those. Roger went above and beyond the call of duty and painstakingly matched my bookcases, not only in style, but also stain and quality. The result was absolutely beautiful.Living in one of Roger's custom designed homes, you cannot help but notice the quality and all of the little details that make a home unique. Honestly, every day, I find myself thinking, "I can't believe I get to live in this house!" We absolutely love our home. Thank you for making our dream home a reality, Roger! Just a short note to express our sincere appreciation for the exceptional work you did in designing and constructing our new rock fireplace which accents our view of the lake. Your concepts far exceeded our thoughts on what could be accomplished and the results of this project give us great pleasure every time we enter the room.In an era when so many are taking shortcuts, it was a great experience for us to work with a contractor who values quality of workmanship as much of we do. We had Designing Innovations Co. do three projects for us. The project estimates were all complete and understandable. Roger was easy to work with in reviewing the estimates and made the changes we requested. A revised estimate was prepared and when accepted was the basis for the detailed contract entered into. All projects where done in a very professional manner. Changes during construction were handled professionally with change orders so the cost of the change was completely understood and accepted. Roger was always open to discussion regarding items as the project progressed and the work site was always left neat and safe.We have no problem in recommending Designing Innovations Co. as a building contractor. 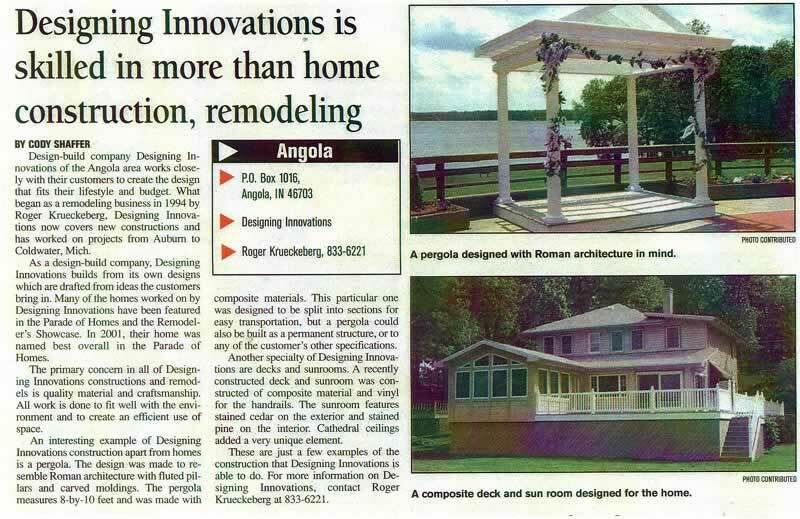 Because we liked Roger Krueckeberg’s eye for design and his quality workmanship on a small remodel project, we chose Designing Innovations to build our new home at Lake Gage. Roger and his crew were easy to work with and we always knew the job was being done right. Frequently we deferred to Roger on decisions because we trusted his instincts and his design capability. Where contract work was required, the companies he employed also did quality work and in a professional manner. We never felt pushed or stressed to make decisions and the whole experience was a very good one. We continue to be delighted with our new home.